Enable is red hot favourite to win the Arc De Triomphe at Chantilly and Betfair are offering a monster 25/1 on Enable to win the race on Sunday, plus £100 in free bets for new customers registering via this page! Enable has taken the Flat season by storm and will look to land a fifth consecutive Group One under Frankie Dettori. The aggregate winning distance in those races has been 20 lengths, each being won by five lengths - including the Irish Oaks, the King George and the Yorkshire Oaks. Standard odds on Enable to win is EVENS but you can get a HUGE 25/1 price boost on Enable to win the Arc De Triomphe on at Chantilly! If Enable wins, Betfair will pay out at the quoted price immediately. They will top up your additional winnings within 24hrs. 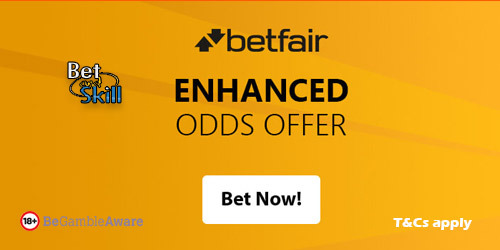 Open a new Betfair account right now in order to take part to this promotion! Plus, get up to £100 in free bets as new customer welcome bonus! Place a bet on Enable to win the Prix de l'Arc de Triomphe in the 'New Customer' market at the enhanced price on the Sportsbook. Max stake €1. 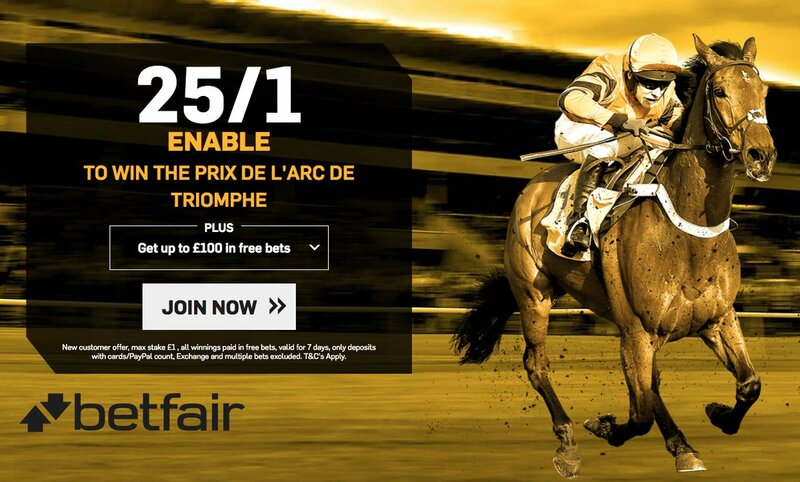 "Get 25/1 Enable to win the Arc De Triomphe at Betfair + £100 free bets"